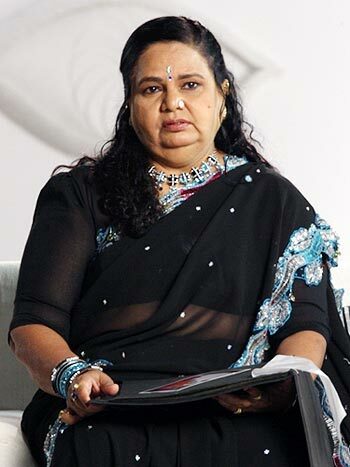 Item girl and drama queen Rakhi Sawant's mother Jaya Sawant is one of the housemates on Bigg Boss 3. Jaya is pitted against Rakhi, who is currently making news on another reality series Pati Patni Aur Woh on a rival channel. Things have been rough between Rakhi and her family for sometime now -- so much so that Rakhi didn't even invite her mother and brother to the finale of another reality show Swayamvar. At that time, Jaya had wept on camera and apologised to Rakhi. Does Jaya want to clean up her public image by explaining the different accusations of her daughter through Bigg Boss? Rajul Hegde finds out from her daughter. Was it a shock for you to see your mother in Bigg Boss 3? Yes. I never imagined that my mother would do any reality show or work in this industry. I heard stories that she may take part but I thought they were just rumours. I shocked my mother by not inviting her to my Swayamvar but she gave me a bigger shock by taking part in Bigg Boss. Reality shows are meant for youngsters because they are put in lot of difficult situations and surviving there is not easy for anyone be it mentally or physically. I don't think my mom will be able to survive there. I am really worried for her because she has too many health problems. She can't remain hungry for long and has some problem with her hand and has difficultly in brushing her hair. Sometime back she couldn't even get up and walk but I was stunned to see her do a nice catwalk on the premiere. Did she ever inform you about her participation? No. Recently we met in a salon where she had come there to perm (curl) her hair. I was wondering why she was doing it. After watching her on Bigg Boss I came to know that she was doing all the preparations for this show. She did not say a single word about it because we are not in talking terms. Now she is there so it's fine. It is going to be very difficult for her in the house because she gets a bad headache if she doesn't take a nap in the afternoon. House rule is that you cannot sleep during the day. Do you think that your mother Jaya is taking revenge? I am her daughter. Why would she take revenge on me? But I think she shouldn't have done this to me. She should understand that my reality show Pati Patni Aur Woh is also on the air now. She is giving me competition. Let's see what happens. Do you think she is competing with you? No it is just exploitation. They [the channel] knows that my mom is very innocent and my reality show is on air. They have smartly played with her emotions because she does not know anything about reality shows. When two people fight, a third person makes full use of the situation, which is really bad. If anything happens to her in the house I will not leave these people. What will happen if she will get some difficult task? She doesn't understand English; God knows how she signed the contract. She must have thought that since her daughter is star that she would also show her what she could be. It's mother verses daughter now. Do you really think that she is unaware of Bigg Boss rules? I think bechari wahan pe paise ke liye gayi hogi [she must have taken this up for money]. I don't know why she decided to go there. The rules are very strict and it is not easy to follow them. Netaho abhineta sabki kamar tut jaati hai [politicians lose it there]. I am happy that she is there because she will now come to know my true value. Can you comment on the housemates behaviour towards your mom? When my mother went inside the house and introduced herself, there wasn't a single good reaction. I didn't like Taanaz Irani's (another housemate) behaviour. My mother is not a celebrity but they should at least respect her for her age. What is the message you want to give Big Boss? I will not appeal to Bigg Boss because he is deaf but it's Amitabh Bachchanji's responsibility to take care of my mother because he is the one who has sent her inside the house. Whatever fights we have had, at the end of the day she is my mother. I am not saying that she needs to get special treatment but at least they need to take care of her health. I would also like to appeal to the housemates to treat her like their mother and to take care of her and speak in Hindi. Are you nervous that you have competition with your mother? No one can give me competition. Both our show timings are different and my mother can never be like me. I only hope that she doesn't say anything against me that might worsen our relationship. Do you think taking part in a reality is a good break for your mother? She always wanted to become an actress and sacrificed everything after marriage and children. I am happy that she is also going to be celebrity now. So I request all the viewers to support her like they supported me. Will you enter the show as a wild card entry? [Long pause]. No ek myan main do talwar nahi reh sakti [you can't keep two swords in one scabbard]. What was the reason for your differences? Abhishek Awashti (ex boyfriend) was one of the reasons and there were many other reasons also, which I cannot discuss because it's too personal. So I decided to live separately. What do you have to say about rumours of your split with Elesh Parujanwala? If you are hearing about my split then you will have to wait and watch the show Pati Patni Aur Woh. You will come to know how we have spent time with each other. If at all something has happened then you need to understand why it has happened. I am a girl of Indian values and I cannot compromise on anything though I may sport trendy hairstyles and clothes. Who is most likely to win Bigg Boss 3?